This weekend, on Saturday 15 and 16 Sunday March, the Museum Depot at Acton will be opening its doors for its bi-annual Open Weekend. 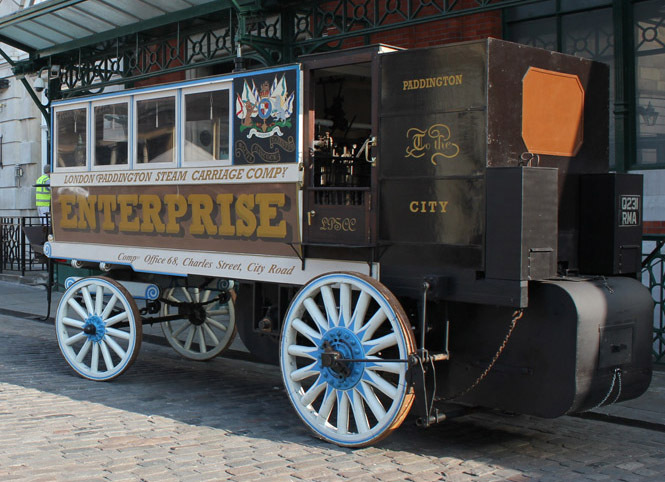 A highlight of the event promises to be the attendance of Walter Hancock’s Enterprise replica steam bus. A faithful replica of the 1833 original, it will be a rare opportunity for the public to see this pioneering bus up close. Walter Hancock’s Enterprise was built by Walter Hancock of Streatham for the London and Paddington Steam Omnibus Company. The vehicle represented the first mechanically propelled passenger bus, entering service on 22 April 1833. It ran a regular service between London Wall and Paddington via Islington and required three men to operate it: a driver, an engine man to control the water and a fireman. With the driver perched at the front and the rest of the crew positioned at the back, it must have been a challenge to communicate with each other. Whilst the top speed was about 20mph, the Enterprise usually cruised at a comfortable 10mph. Up to 14 people could travel on the vehicle, sitting in two rows facing each other. A clever design meant that the fumes were driven away by a fan, ensuring that the exhaust was, in comparison to other steam buses, quite clean. Although others were experimenting with this technology, they tended to be noisy and dirty, with Hancock’s bus a notable exception. The Enterprise was innovative, namely thanks to its pioneering engine configuration and the fact that, unlike Stephenson’s Rocket train of the same era, the working parts were all concealed. Although the Enterprise service was discontinued due to a dispute between Hancock and the operators, Hancock continued to build steam buses. In 1836 he introduced the famous Automaton, running over 700 journeys between the City of London and Paddington, the City of London and Islington and Moorgate and Stratford. Unfortunately, due to the poor state of the roads and opposition from a powerful horse carriage lobby, Hancock had to cease his public services. He did, however, continue to use his buses for personal use! As well as its appearance on the Covent Garden Piazza today, the replica Enterprise will be on show and in steam at the Acton Depot Open Weekend this Saturday and Sunday. Come and see a crucial part of bus history in action as we continue to celebrate Year of the Bus. The Enterprise replica is kindly provided by Tom Brogden. This was our GGGreatGrandfather Walter Hancock [1799-1852].His steam carriages were in fact the worlds first reliable practical engined self-mobile bus and vehicle that ran the worlds very first reliable fare paying engined bus service for 7 continuous months.He also invented the worlds first practical car his 4 seater steam phaeton.Walter Hancock was 60 years ahead of his time in automobile invention and so typical of Britain that high tariffs and political greed drove him out of business and this engineering first and lead was lost in Britain.